Do you currently use Agile Project Management software? The software-centric business model is quickly becoming pervasive in every industry, not just IT. As Jeff Gothelf, co-author of Lean UX, put it, “Software is eating the world.”1 Since the publication of the Agile Manifesto in 2001, the project management (PM) climate has experienced a gradual shift away from the traditional ‘waterfall’ process and toward a more adaptive, Agile model. In the wake of this paradigm shift, many business managers and developers have begun searching both for knowledge of Agile and for practical Agile project management software tools – whether to better manage the software development lifecycle (SDLC) or other non-IT projects. This buyer’s guide will define the methodology of Agile PM as well as the product market and compare four leading Agile PM solutions. The rapid emergence of Agile software startups and corresponding business adoption has made the trend clear: people like Agile. Developers like it. Product owners like it. Customers don’t know it, but they like it, too, because they reap its benefits every day. Most Agile management tools draw elements from more than one of these, which means the product market is broad and eclectic. This has led to increased use of Agile as an umbrella term encompassing all or most aspects of the four frameworks above. Agile advocates tout its ability to better manage changing priorities, improve visibility, reduce risk, speed up time-to-market, better align IT and business values, and simplify the development process. Next, we’ll show you four of the best agile project management software, provide examples of their use, and compare them on the basis of common features. Which Agile Project Management software is right for your business? JIRA Agile is an add-on for JIRA created by PM giant Atlassian. JIRA Agile targets development teams looking to implement Agile methodology with a smaller learning curve. It’s one of the most comprehensive Agile products currently on the market, with a full range of Agile features including Scrum, Kanban, burndown charts, sprints, velocity metrics, and more. The add-on’s functionality consists of four key components which apply to the user’s choice of either Scrum or Kanban-focused implementation: planning, estimating, prioritizing, executing, and evolving. Project managers and owners have access to detailed reports and analytics about the status of the product, such as the cumulative flow diagram, which shows the status and volume of project issues over time. Some might consider the fact that you’ll first need a subscription to the basic Atlassian JIRA as a drawback. But the monthly price for both is user-based, scalable, and affordable for a product of this caliber. 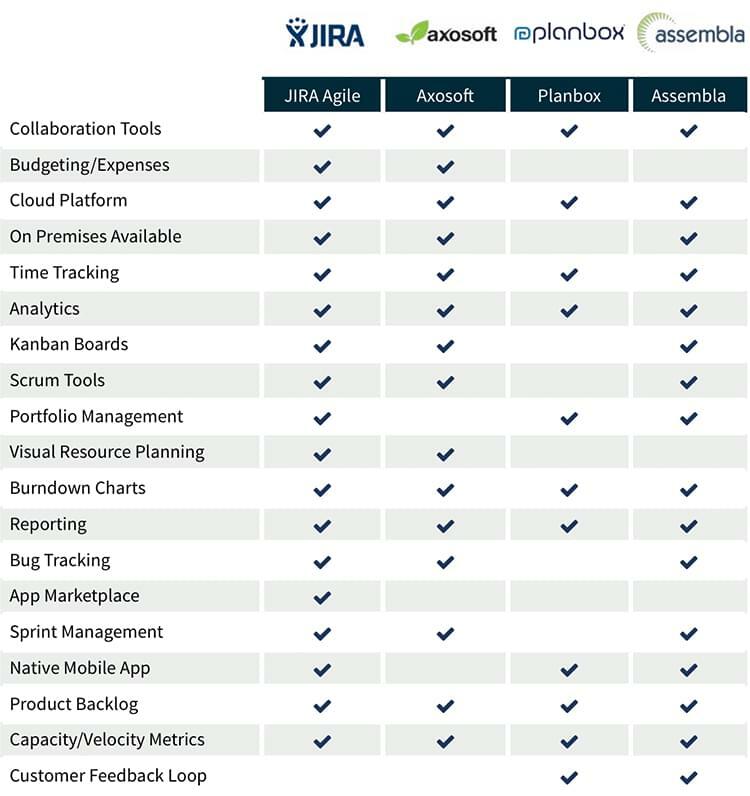 Not only that, using Atlassian JIRA + JIRA Agile means you’ll have access to sophisticated features that basic Agile software does not offer, such as portfolio management, expense tracking, and a fully-stocked app marketplace. JIRA is available both as software-as-a-service (SaaS) or a traditional, on-premise installation. Puppet Labs is a software company based in Portland, Oregon that focuses on IT automation and infrastructure. When they grew from a small start-up to a venture-backed company of 300 employees, they decided it was time to implement a better system for managing and connecting customer issues with development. They turned to Atlassian, implementing a stack of products including JIRA Agile, JIRA Service Desk, Confluence, and HipChat. Deployment took only six weeks, and Puppet Labs saw immediate results. Axosoft is a Scrum-specific project management tool for product developers that provides access to an essential PM toolkit, as well as bug-tracking, help desk operations, and developer collaboration wikis. Axosoft has serviced over 11,000 teams, including some at noteworthy companies like Cisco, Boeing, and NASA. Their software can be purchased in modules or as a complete product suite, which is available in both on-premise and cloud-hosted versions, depending on your needs. Axosoft takes developers through the process in three phases, aligned with the methodology of Scrum: backlog management, process definition and visualization, and product ‘shipment.’ Unlike some vendors that place a cap on projects per month, Axosoft lets you create and tackle unlimited projects, subprojects, stories, and epics with user-specific access. The drag-and-drop interface lets you manage your backlog, sprints, user stories, and releases with ease, and includes helpful prioritization tools and work-in-progress indicators to keep your team running smoothly. Like many Agile vendors, Axosoft takes a mixed approach to the methodology, giving users Scrum and Kanban tools, including a fully interactive Card View mode. Axosoft only has a few pre-built integrations, but they do offer API access for further integration with third-party systems. The product suite’s pricing is comparable to JIRA, however, if you only need one or two of the modules (e.g. Scrum and the free bug tracker), you could see considerable savings. Planbox was originally created in 2009 as an in-house solution for tech sponsorship company, Bolidea. Since then, the Agile project management tool has created its own brand, servicing start-ups and Fortune 500 companies like Starbucks, Phillips, Stanford University, and the University of Michigan. Unlike our first two products, Planbox is only available in a cloud version, which the developers believe is the best way to provide constant access to updated versions, new features, etc. Planbox is geared toward a more general audience than some of its competitors; it’s a good fit for marketing teams, IT, developers, and Agile novices and pros alike. The work hierarchy is broken down into four essential components: initiatives, projects, items, and tasks, with real-time updates, notifications, time tracking, velocity charts, storyboards, deadlines, and reporting to help you and your team manage it all. One unique feature Planbox offers is a built-in customer feedback loop, which helps more closely align your decision-making process with customer values. While the system doesn’t explicitly implement Agile tools like sprints or Kanban boards, it does embody the flexible, iterative framework of Agile project management. Neuralitic is a leading provider of mobile intelligence solutions based in Montreal, Canada. They help communication service providers (CSPs) in North America, Eurpoe, and Asia exploit the value of their subscribers’ data. Before Planbox, they were using AtTask for their project management needs, but were having issues with team adoption, which lead to inefficiency, manual sharing, and information silos. Assembla specializes in providing Agile, online project collaboration solutions for distributed teams, with an emphasis on task management and issue tracking. The company itself is still relatively young – founded in 2005 – but they’ve already achieved major success and carved out their place in the PM market, boasting over a million users in 100 different countries, and contracts with companies like Ebay, PayPal, Intuit, and HTC. The product itself is all about driving continuous delivery with a robust, but intuitive set of Agile tools: Kanban, testing workflows, task management, sprint planning and execution, backlog management, burndown charts, bug tracking, and many others. Assembla’s cloud platform and strong collaboration features allow teams to work together regardless of location, keeping everyone focused on the big picture. Another core feature is unlimited software configuration management (SCM) and deployment through Subversion, Git, or Perforce, for which most other vendors require a separate add-on. In order to ensure faster development and less stress, CEO Andy Singleton has vowed that Assembla experiments with all software releases on their own team before making them available to the public. As a result, they’ve moved from releasing every two weeks to ten times per day. The Garrigan Lyman Group (GLG) is a Seattle-based digital marketing agency that develops custom apps, websites, ecommerce solutions, and social media widgets. Their services are geared toward helping clients achieve greater customer loyalty. In 2010, GLG was concerned about the loyalty of its own customer base in the wake of company expansion. They had visibility issues, tracking issues, and resource management issues. The team received client feature requests via email or through extranet, and clients had no visibility into the status of their requests. It wasn’t long before everyone at GLG had turned to Assembla. Now they use the ticketing feature to receive feature requests within the system, prioritize them, and keep clients informed.